T-Mobile have opened a brand new state of the art store in Nottingham. The store has utilised many brand new retail concepts, which have been brought to the world of mobile phone retail for the first time. 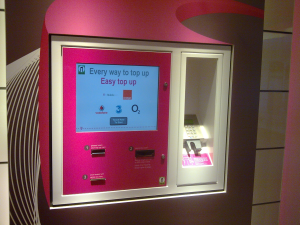 One such concept is the Cammax Chip & PIN self serve e-top-up machine which T Mobile specified. This bespoke machine is built into the wall and is an integral part of the shop fit. It offers e-voucher and e-top-up for all the major UK networks, and accepts cash and Chip & PIN. Cammax software engineers designed both the front end UI, working closely with T Mobile, as well as the back end, working closely with secure encrypted transactions company e-pay.